2. (i) Write five differences between Hindu and Muslim society. Muslims believe in ONE God, but Hindus worship many gods and goddesses. In Islam, all humans are created equal but Hinduism has a caste system, with four major castes. Hindus believe that your body and soul comes back after your death and ‘you re-live, Muslims believe in the day of judgment only. Muslims eat all wholesome food including meat of Cow, goat, and chicken while cow ‘is a sacred animal-and a deity for . Hindus, Hindus believes in songs and dance and Muslims do not. Islam shall be the state religion of Pakistan. 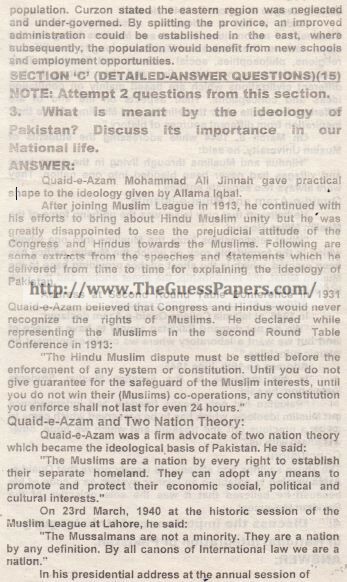 The constitution laid down that only Muslims shall be elected president and Prime Minister of Pakistan. On non- Muslim could hold these offices. The state shall try to make the teachings of Holy Quran and Islamiat compulsory to encourage and facilitate the learning of Arabic language. The state shall endeavor to strengthen fraternal relations among lAuslim countries in order to promote Islamic unity. 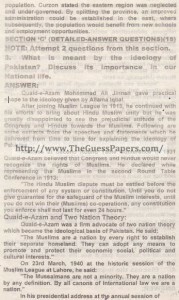 (iii) State here aims and objectives of the All India Muslim League. (i) To inculcate among Muslims a feeling of loyalty to the government and to disabuse their minds of misunderstandings and misconceptions of its actions and intentions. (ii) To protect and advance the political rights and interests of the Muslims of India and to represent their needs and aspirations to the government from time to time. (iii) To prevent the growth of ill will between Muslims and other nationalities without compromising to its own purposes. 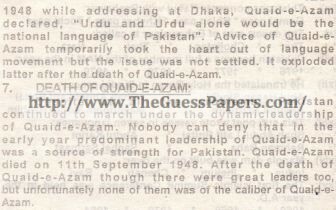 (iv) Write note on anyone regional language of Pakistan. (v) Mention any five principles of Pakistan’s foreign policy. (vi) Write Indus basin Treaty. India, it could potentially create droughts and famines in Pakistan, especially at times of war. However, India did not revoke the treaty during any of three later Indo-Pakistani Wars. OR Explain the Geographical Importance of Pakistan. Pakistan in Asia has much geographical importance because of its strateqlc location. Firstly, Pakistan has all features of nature like sea, deserts, mountains, rivers. Secondly, in this region there are four seasons; summer, winter, autumn and spring. Pakistan shares its borders with very prominent countries in the world like India, China, Afghanistan and Iran. Land lock countries do not have route for the transportation of goods by sea therefore, Pakistan also provides sea transportation to some countries. Interestingly, Pakistan is a Muslim country and it is located in the chain of the Muslim countries therefore, it is also known as “Center of Muslim World”. The Lahore Resolution, commonly known as the Pakistan Resolution was a formal political statement adopted by the Muslim League on the occasion of its three-day general session on March 22-24, 1940 that called for the creation of ‘independent states’ for Muslims in British India. The constituent units of these states were to be autonomous and sovereign. This was later interpreted as a demand for a separate Muslim state, Pakistan. The resolution was presented by A. K. Fazlul Huq. .
(viii) Write about any two natural resources of Pakistan. OR Why was the province of Bengal divided in 1905? 4. Discuss the importance of Urdu language in National integration of Pakistan. Languages of Pakistan include the two official languages: Urdu and English, which are spoken as first languages by relatively small numbers of people, but commonly used throughout the country. Urdu is also Pakistan’s national language and lingua franca. The four major provincial languages of Pakistan are Punjabi, Pashto, Sindhi and Balochi. Other major regional languages are Saraiki, Hindko, Pahari-Potwari and Brahui. Farsi is also spoken by significant proportions of the population. Dialects such as Dari are popular as well as some regional dialects. Farsi speakers are mainly concentrated in Khyber Pakhtunkhwa, Baluchistan and some elite areas of Western Punjab. Most of the languages of Pakistan belong to the Indo- Iranian group of the Indo-European language family. Urdu speakers is the fourth largest in the world. Mughals hailed from the Barlas tribe which was of Mongol origin, the tribe had embraced Turkic and Persian culture, and resided in Turkestan and Khorasan. Their mother tongue was the Chaghatai language (known to them as Turki, “Turkic”) and they were equally at home in Persian, the lingua franca of the Timurid elite. But after their arrival in the Indian subcontinent, the need to communicate with local inhabitants led to use of Indic languages written in the Persian alphabet, with some literary conventions and vocabulary retained from Persian and Turkic; this eventually became a new standard called Hindustani, which is the direct predecessor of Urdu. Sindhi region. The Hindus sing Bhajans but Pakistani culture has adopted Qawwali which is a praise of the Holy Prophet P.B.U.H. Pakistani culture is rich in the literatures of Urdu, Punjabi, Sindhi, Pashtu, Baruhi, Baluchi and Kashmiri languages. Urdu literature boasts of the masterpieces of Maulana Azad, Iqbal, Shibli, Hall, Ghalib, Agha Hashar, Manto and Faiz whereas the Punjabi literature stands out with great names like Waris Shah, Sultan Bahu, Ghulam Farid, Bulhay Shah and Shah Hussain etc. Similarly, Sindhi literature glitters with the masterpieces of Shah Abdul Latif, Sachal Sarmast, Shah Qadir Bakhsh, and Faqir Nabi Bakhsh. The Pashto literature also boasts of names like Sheikh Saleh, Raghoon Khan, Akhund dardeeza, Khushal Khan Khattak and Rahman Baba. The Baluchi literature comprises of masterpieces of Jam Durk, Muhammad AIi, Zahoor Shah Hashmi, Ghani I?arvez, Hasrat Baluch, Abbas Ali Zemi and Aziz Bugti etc. Pakistani society is dominated by male members. Each family is headed by the senior most male member who is responsible for arranging the bread and butter of the family. Pakistani culture is rich in variety of dresses: The people of Punjab, the Pathans of NWFP, the Baluchi people and the Sindhis wear their own distinct dresses. These dresses are very colorful and prominent and give attractive look during national fairs and festivals. Baba Farid Gunj Shakar, Baba Gulu Shah, Pir Jamaat Ali Shah, Abdul Latif Bhitaii, Hazrat Noshah Ganj Bakhsh, Bari Imam, Lal Shahbaz Qalandar, and Bahauddin Zakriya are celebrated with great fervour. Pakistani people are great lovers of sports and games. Modern games like hockey, cricket, football, badminton, squash, table tennis and lawn tennis are played throughout the country. In addition wrestling, boxing, and athletics are also very popular among masses. Pakistan has produced great sportsmen in the past. These include Bholu in Wrestling, Hanif, Miandad, Imran, Wasim Akram, and Inzamam in cricket, Shehnaz sheikh, Islahuddin, Khalid mahmood, Akhtar Rasool, and Munir Oar in hockey and Jahangir, Jansher in squash. OR What problems were faced by Pakistan soon after its creation? Pakistan came into existence on 14th august 1947. Soon after its establishment Pakistan faced number of problems. Most of the problems of Pakistan were related with Pakistan dispute with India, such as the accession of the princely states, canal Water dispute, refugees’ problems and distribution of armed and military assets. Infect most of these problems were deliberately created by India itself so that Pakistan would not maintain its independent status and soon merged with India. 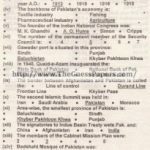 The Indian Independence Act 1947 provided the formation of two boundary commissions for the division of the provinces of Punjab and Bengal between India and Pakistan. Each boundary commission consisted of representatives from India and Pakistan. Both India and Pakistan were agreed to accept the decision of Radcliff incase of deadlock. As expected the representatives of India and Pakistan were unable to reach on an agreement and Radcliff announced his own decisions on 16th August 1947. At the time of partition there were 462 princely states in subcontinent that cover 1/3 of Indian Territory and 1/4 of its population. Rulers of these princely states were given option by the British government either to join India, Pakistan or remain independent. However these states were advised to consider geographical location and religious trends of their respective states before accession to the either country. By rs” August most of these states announced their accession to either India or Pakistan except Kashmir, Hyderabad and Junagadh. It had its origin in Radcliff Award which drew the boundary India and Pakistan in way that it cut across the rivers and canal making India the upper beneficiary and Pakistan the lower beneficiary, It also handed over the control over two important headwork’s over river Ravi (Madhupure Head works) and Sutlej (Fe! ;ozpure Head works) to India. There was no reason of assigning these head works to India, as these two Headwork’s used to control the flow and distribution of water in the area that were included in Pakistan, except to put the economic life of Pakistan in danger. It was announced on July I, 1947that Indian army would also be divided in ratio 65 to 35 in India’s favor it was with reference of the communal balance present in the B r i tis h In d i a n Arm y. Whatever Pakistan received was nothing but scrap and out of order machines, broken weapons, unserviceable artillery and aircraft. There were f sordnence factories and all were located in India. Pakistan was given 60 million rupees towards its share in the ordnance factories. 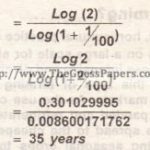 Division of financial assets: At the time of division there was cash balance of 4 billion rupees in the reserve Bank of India which was to be divided between India and Pakislan in the ratio of 17 to India and 5 to Pakistan. Pakistan was to receive 750 million rupees, which was in initially delayed by the Indian Government. After the protest of Pakistan, India agreed to pay 200million rupees. As the war between India and Pakistan had started on the issue of Kashmir India again stopped the rest of the amount by saying that Pakistan could use it to buy arms. After the protest from Pakistan and the threat of hunger strike by Gandhi, Nehru was forced to pay another 500′ million rupees. However the remaining 50 million rupees are still not paid. The money was Pakistan’s rightful share. India deliberately withholds it because they hoped that Pakistan would become bankrupt.